Fans of the BBC TV show The Apprentice will remember a candidate who styled himself as Stuart ‘The Brand’ Baggs. While his idea of branding was certainly misguided, it was nonetheless a memorable gimmick. As a writer, it is similarly important to consider how you’ll be perceived by your readers. Next time you’re in a bookshop or a library, have a look at some of the book covers. You’ll often find that books by the same author share certain elements: perhaps the author’s name is written in a particular typeface, or perhaps a certain style of artwork is common between them. But branding goes so much deeper than a cover. It can include the personality or values that you want to convey to the reader. My own branding begins with my moniker: Gavin Cameron is actually my first and middle names. My real last name is Cruickshank, but I don’t use it because there are several possible variations in the spelling, and it serves as a small distinction between my real life and writing life. Not to mention that Crookshanks is Hermione Granger’s cat in the Harry Potter series. There is a long literary tradition of pseudonyms, and this is catered for in the standard manuscript format. Your real name goes in the address at the top left-hand corner, while your pen name is included in the byline underneath the title. I also mention it in the body of the e-mail or on the cover sheet. Even so, the issue does occasionally cause problems. A couple of times, show organisers have thought that Gavin Cameron and Gavin Cruickshank were two different people. One organiser recently made publicity material in the name of Cruickshank instead of Cameron, and it’s now being corrected. On the same subject, you might have noticed my Twitter name @LadyGavGav. Although I’ve never liked my first name being shortened to Gav, and still don’t, I felt I had to take that Twitter name as it was available and was an improvement over my previous handle @Knaw_Says. This is the last Monday of working on my MLitt Dissertation, freeing me to give you more in-depth entries from next week onwards. But I’ve one more filler photo for you, and it’s the cover of said dissertation. There is a creative part of up to 15,000 words, which can include prose and/or poetry, and 3,000-word part to discuss it further. 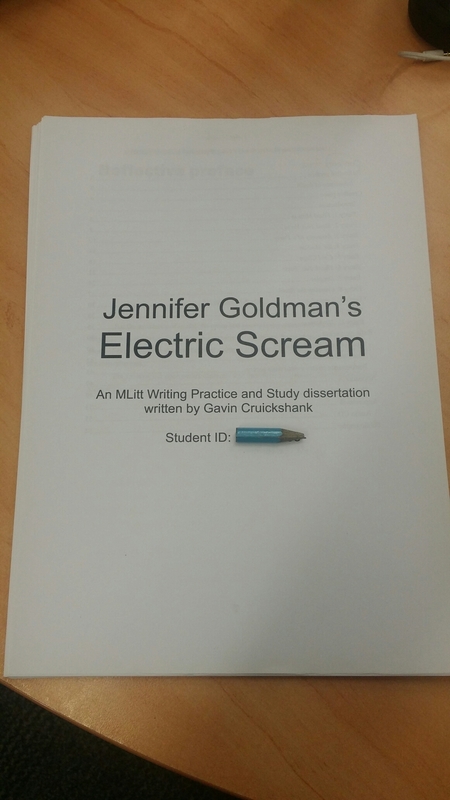 Jennifer Goldman’s Electric Scream is set in 2027 and is written from the perspective of a 29-year-old poet who finds and transcribes a video diary she kept as a student in 2016. You might notice the dissertation is ‘written by Gavin Cruickshank’, and that’s because I have to use my legal name. I would otherwise use my middle name Cameron. Last week, I was speaking to a poet and I accidentally used this individual’s last name, which can also work as a first name. The poet accepted my apologies but described such mistakes as a ‘pet hate’. I was furious with myself not only for doing it to someone whose work I admire, but because I feel the same way when someone spells Cruickshank incorrectly, especially when I’ve spelt it out or the other party has made an assumption. J K Rowling didn’t help by giving Hermione Granger a cat called Crookshanks. I therefore use my middle name to avoid the spelling issue. Of course, this sometimes causes as much confusion as it saves. At a reading a couple of weeks ago, the organiser thought Gavin Cameron and Gavin Cruickshank were two different people and wasn’t sure which of us had agreed to participate. Recently, an editor accidentally sent me some documents with my legal name in the byline. It was half my fault for not making it clear enough, but it brought home just how important it is to separate the two. I started using my pseudonym before I took up writing. Until recently, I presented a show on hospital radio and promoted my middle to my last name, becoming Gavin Cameron. It sounds clearer through a microphone than my actual name Gavin Cruickshank, and more people know how to pronounce the written form correctly. Let me point out that this was before David Cameron was elected. Despite the connections, it’s proved useful in writing because I work full-time and it helps keep a clear separation between the two. I do think that if a writer uses a pen name, for whatever reason, he or she should inhabit the name and adopt the character. I occasionally read authors introducing themselves as, for instance, John Smith writing as Joe Public. Why craft a pen name if you’re going to break the illusion? I did it in this entry purely to demonstrate a point, but in a book or story, I would never explain Gavin Cruickshank writing as Gavin Cameron. But I can think of one person who has done this successfully, and with a double pseudonym. Rapper Marshall Mathers goes by the stage name Eminem, but refers to himself as Slim Shady in his music. When you’re listening to his albums, he does it so naturally that you simply don’t question it. I don’t think Mathers/Eminem/Shady reads this blog, but if he does, well done those men.